My theme for Christmas in July seems to unintentionally be based around peace – something I’m sure we all wish there was more of in our world. 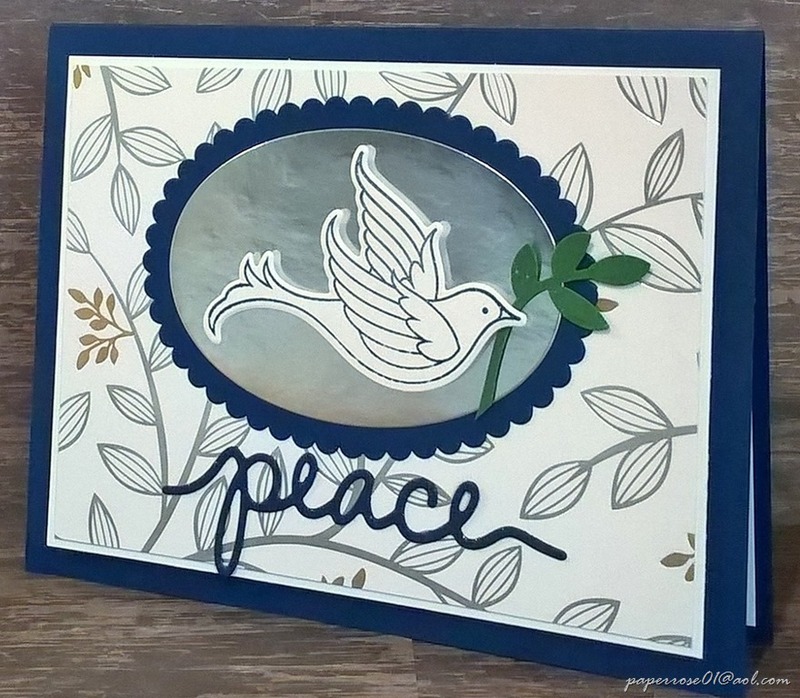 This navy, white, silver and gold card is certainly peaceful. Our dove is from the new Serene Garden stamp set found on page 166 in the new catalog. The Garden Scene Framelits provide the die for the dove. We will be seeing more of this set in the future. The background DSP is from the gorgeous springtime foil DSP available during Sale-A-Brations. This DSP features leaves in both silver and gold. The dove is popped up on dimensionals on a silver background framed in navy and clutches a Garden Green “olive branch”. The die for “peace” is retired and several years old. Somehow we continue to use it every year. 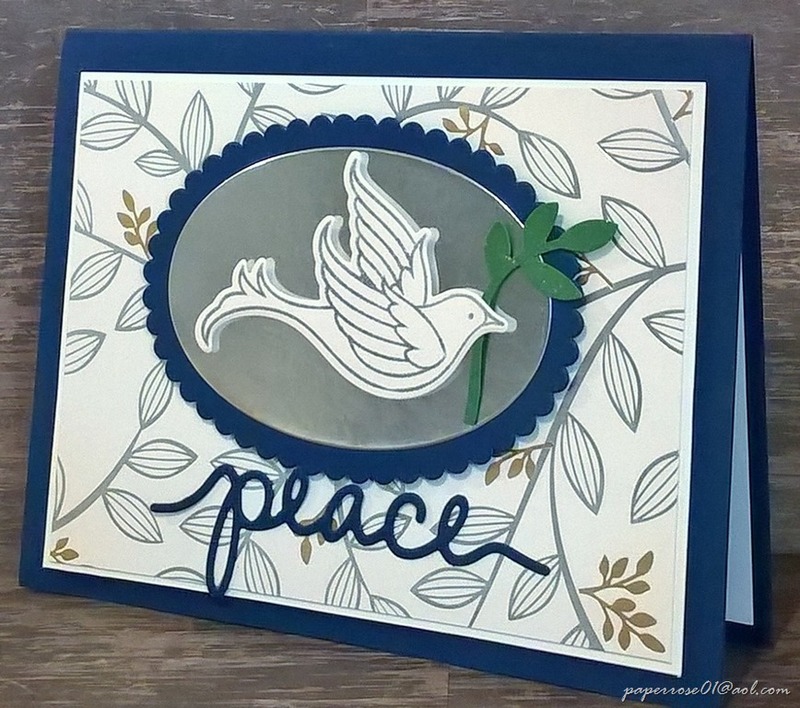 In the first sample, peace has been “glittered” with Wink of Stella as has the “olive branch.” In this second sample, the dove was stamped in Smoky Slate instead of navy and “peace” remains the un-glittered cs. 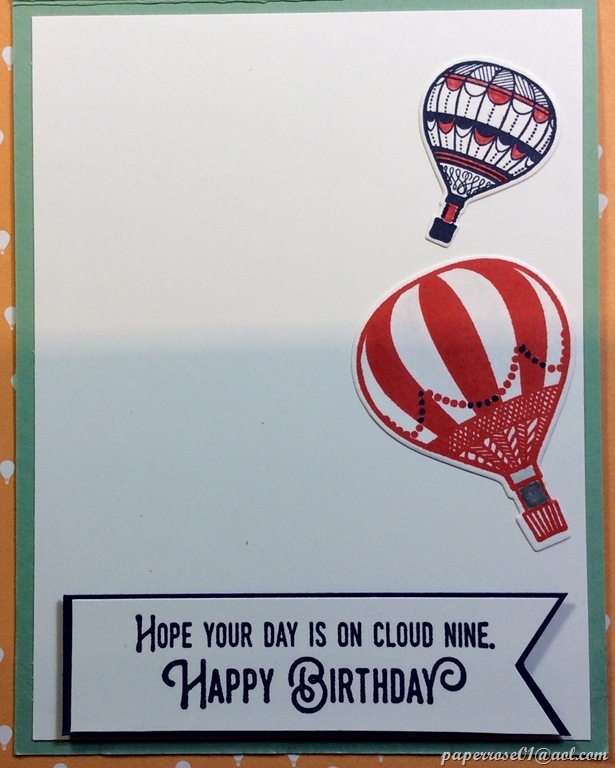 This is an easy but elegant card. The cut-out work will be done for you – your job will be to simply put the pieces together. As a reminder, the Christmas in July Stamp-A-Stack will be held on Thursday, July 19 from 11 am to 7 pm, and on Saturday, July 21 from 9 am to 4 pm. The cost, which includes your very own Wink of Stella to take home, is $14 for 4 cards, $21 for 8 cards, $30 for 12 cards, and $38 for 16 cards. I am asking for attendance acknowledgements now as I have out-of-town company in early July so I am doing the majority of my prep work now. I have 54 poinsettias stamped and cu,t and need to know how many more we will need – 10? 20? 30? One additional Christmas card remains – Christmas reindeer. It will be posted shortly. 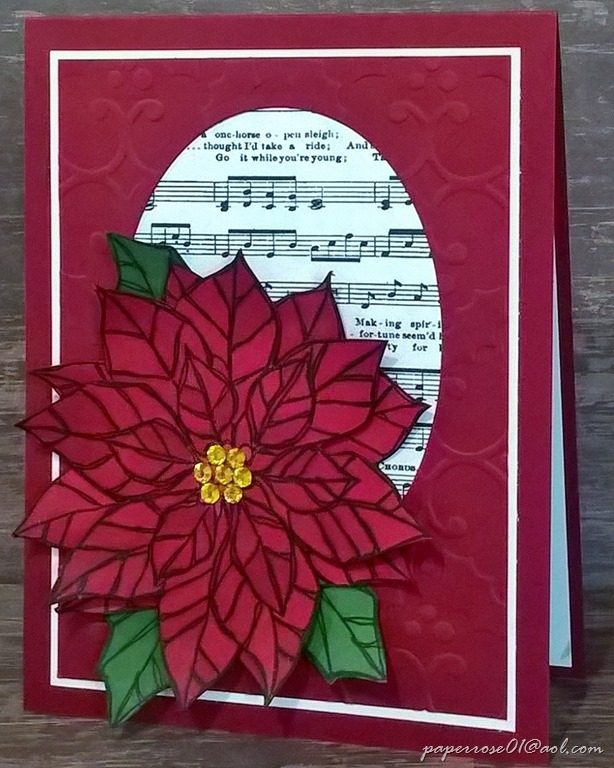 Musical Christmas was an interesting card to create. It reminds me of both the visual and audio beauty of the Christmas season. 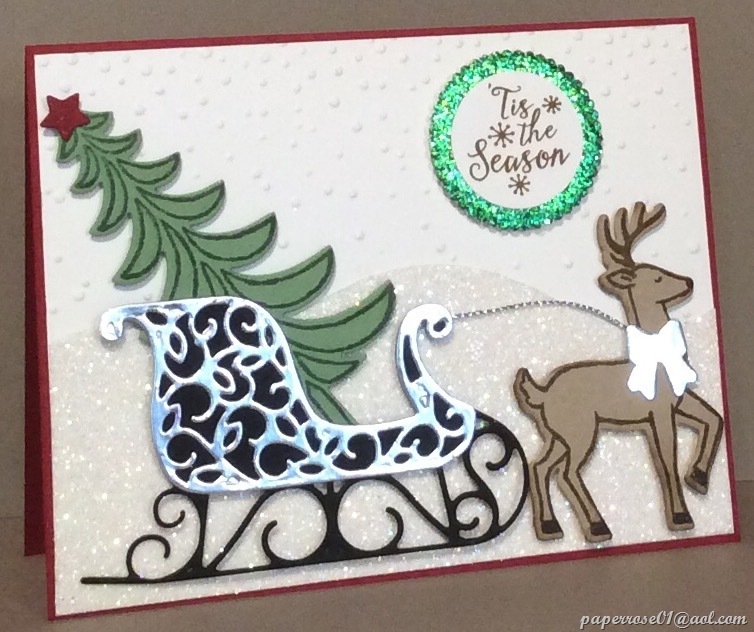 During the 2017 holiday season, I purchased several packages of the Stampin’Up Merry Music Designer Series Paper (DSP). Sadly, we never used it so I resurrected this DSP for our 2018 holiday season. 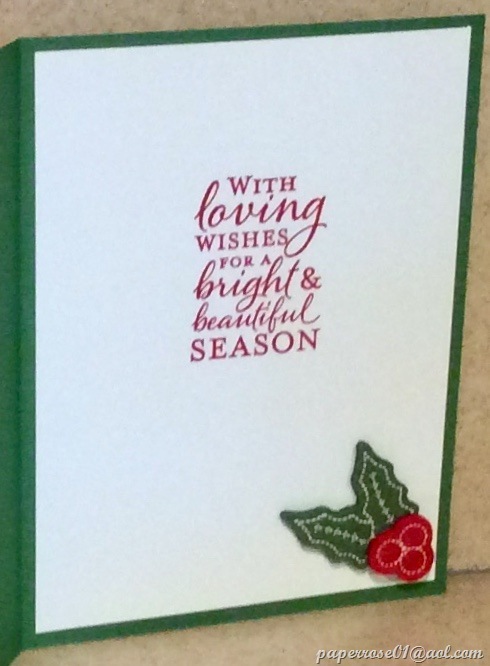 The top Cherry Cobbler layer has been embossed with the retired Holly Embossing Folder. An oval is die cut and the DSP is adhered behind the oval opening. Actually, we die cut the oval and THEN emboss this layer. This top layer is adhered to Whisper White CS and then popped up on dimensionals on the card front. 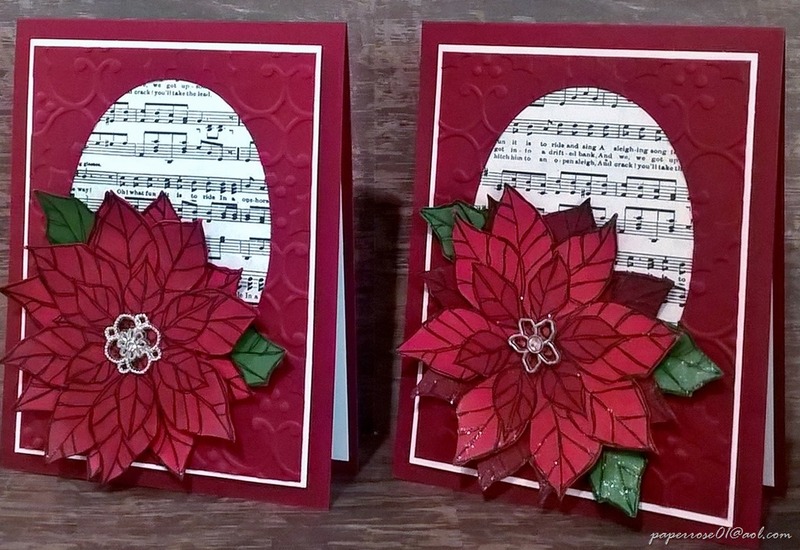 The2-layered poinsettia is stamped from the retired Joyful Christmas Stamp Set and cut out with my Stamp’n’Cut. 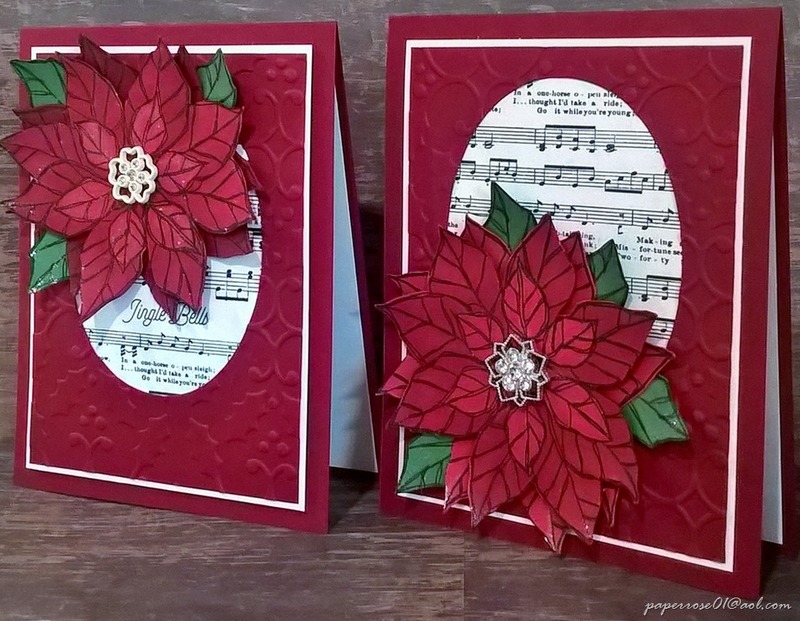 The poinsettias are then colored with the light and dark Cherry Cobbler Stampin’ Blends. The poinsettias are in shades of red but change hue when colored. This gives a nice contrast to the Cherry Cobbler Card. Wink of Stella is used on the poinsettias – some heavily, some lightly. Some of the Garden Green leaves are colored with the Old Olive Stampin’ Blends and som e are colored with Wink of Stella. As you can see, each card is slightly different as the music score ends up on different lines. Also, each poinsettia is different – both in the coloring and in the center bloom. You have the option of using a bloom of clear or colored rhinestones, or one or more of the rhinestone embellishments shown here. 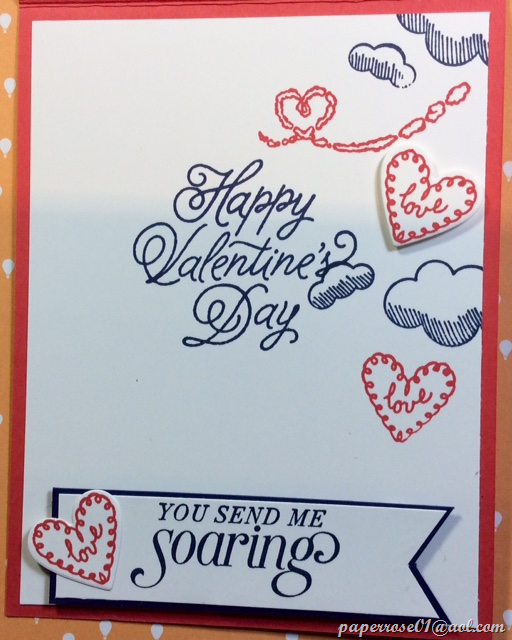 If sending this beautiful card in the mail, remember to add a layer of cs over the bloom embellishment. 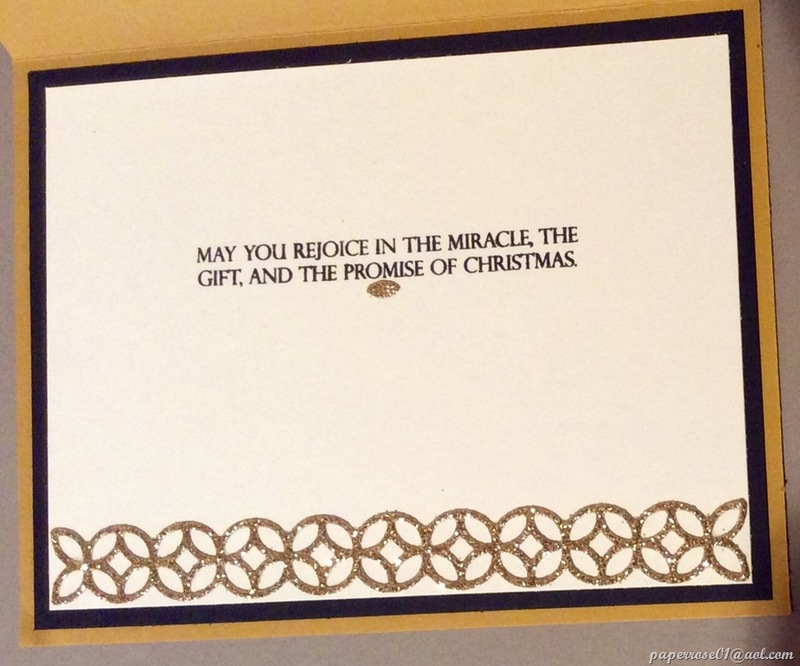 You don’t want the rhinestone embellishment tearing through the envelope. 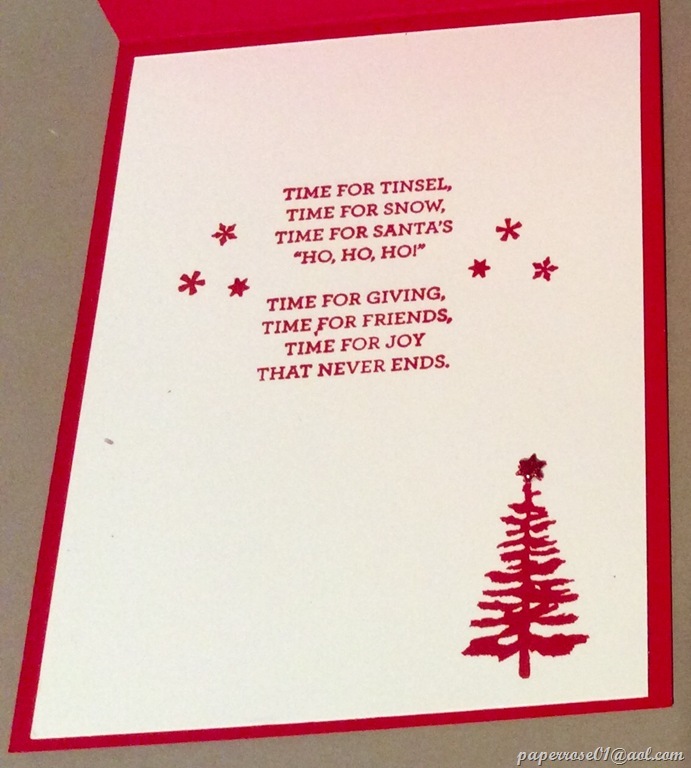 We have now seen 2 of the 4 Christmas in July Stamp-a-Stack samples. Have you checked your calendar for to see if you are free to come on July 19 or 21? Stay tune for Dove of Peace. 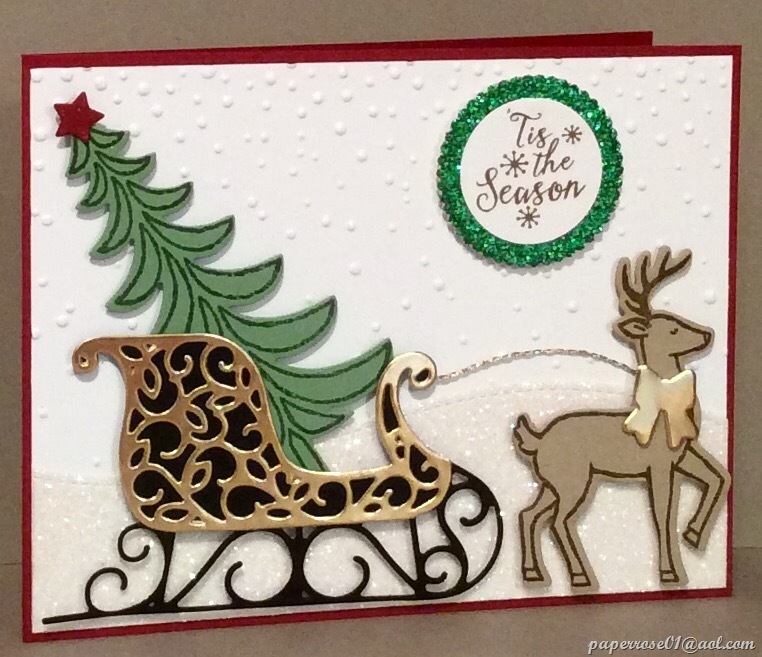 Hi Crafters – As I explained in a recent email, November Stamp Camp will offer the same cards originally scheduled for the Christmas Stamp-a-Stack. These 4 cards are shown below and will allow you to pick and choose for November Stamp Camp which will be held November 2 from 12 N to 8 PM, November 3 from 12 N to 8 PM, and November 4 from 8 AM to 4 PM. Note that I have increased the hours. Christmas Pines is a delightful card done in Early Espresso, Crumb Cake, Whisper White and a touch of Garden Green in the pine greenery. 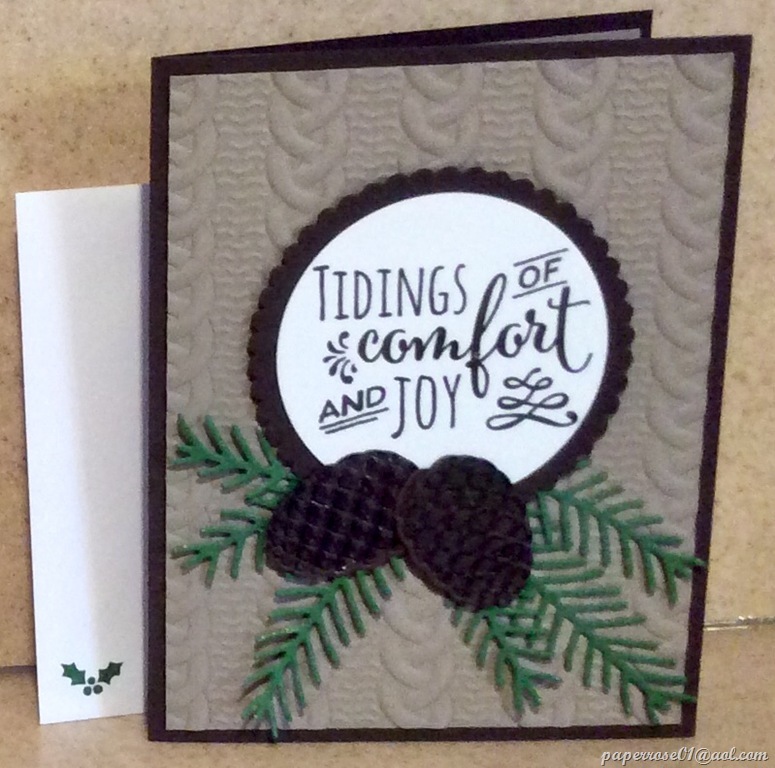 The warm and cozy Cable Knit embossing folder provides lots of depth and interest. There are dies for the circles, pine cones and greenery. Wink of Stella adds lots of glimmer to the pinecones and greenery. 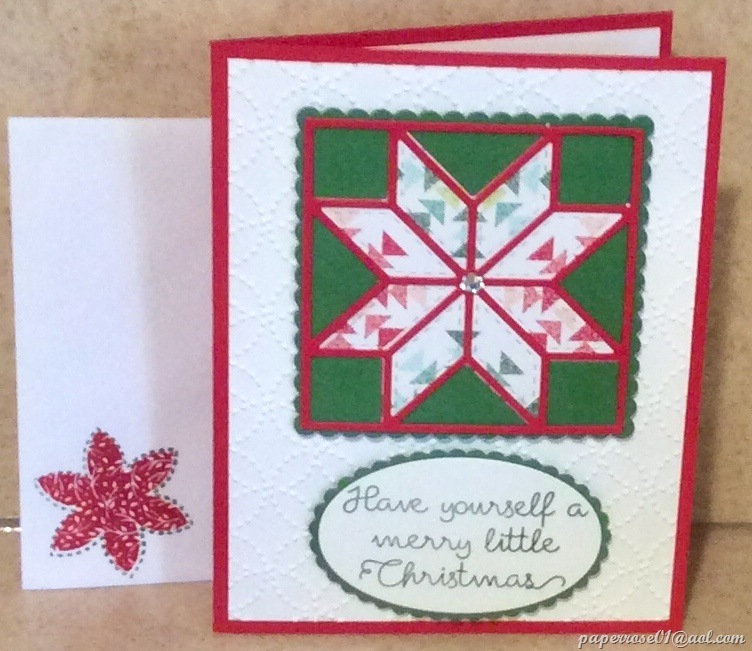 I adore the Christmas Quilt card. There are many different patterns you can choose from in the Quilted Christmas 6” X 6” DSP Stack and many different ways you can arrange the patterns. I am partial to the multi-colored patterns but the red and green patterns are also nice. Although you can’t tell from this image, the quilted piece is “stitched” which is an option. The new Quilt Top Textured Impressions Embossing Folder provides lots of texture. A special embellishment for the message layer of the Christmas Quilt card is the addition of a stitched felt embellishment (p. 5 in the 2017 holiday catalog). 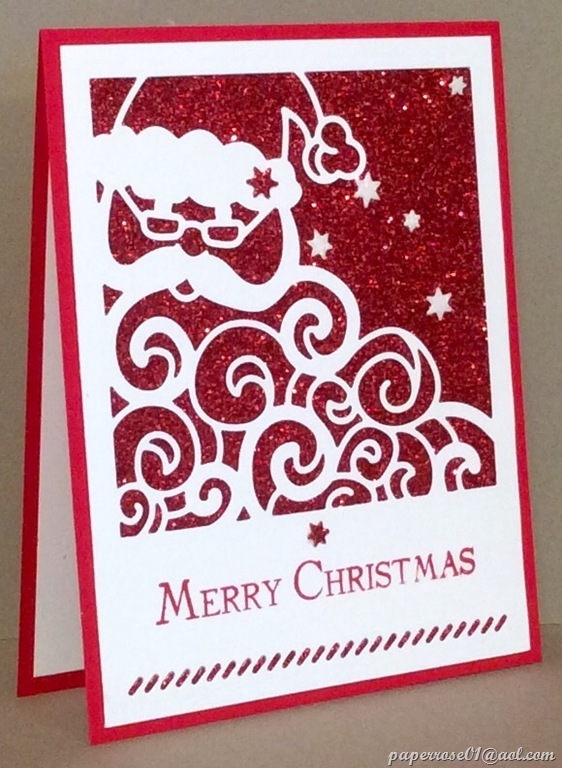 Every card will include a red felt star, a holly embellishment as seen here, or a green felt tree. I added a glimmer star to the tree on a card I did. You can also stamp a tree if you prefer. Night in Bethlehem was a favorite of many of those at October Stamp Camp. This navy and silver card depicts Bethlehem stamped in Smoky Slate and then 2 different views die cut in metallic silver foil and adhered. 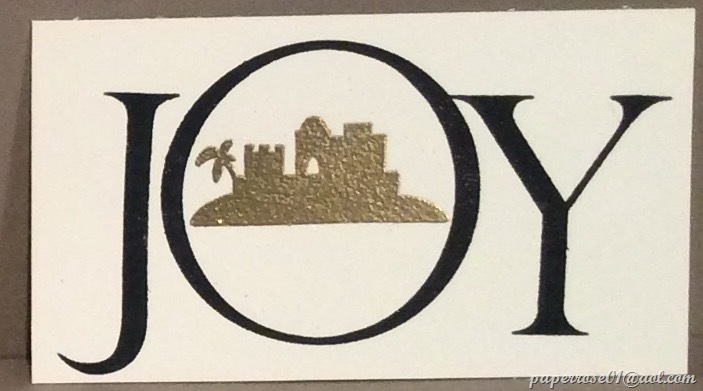 The trick to the card is keeping glue smudges and indentations off the foil. The bottom die cut Bethlehem layer is “padded” with dimensionals on the upper middle buildings. The circle is then trimmed with snips and overlaid with a navy circular frame. 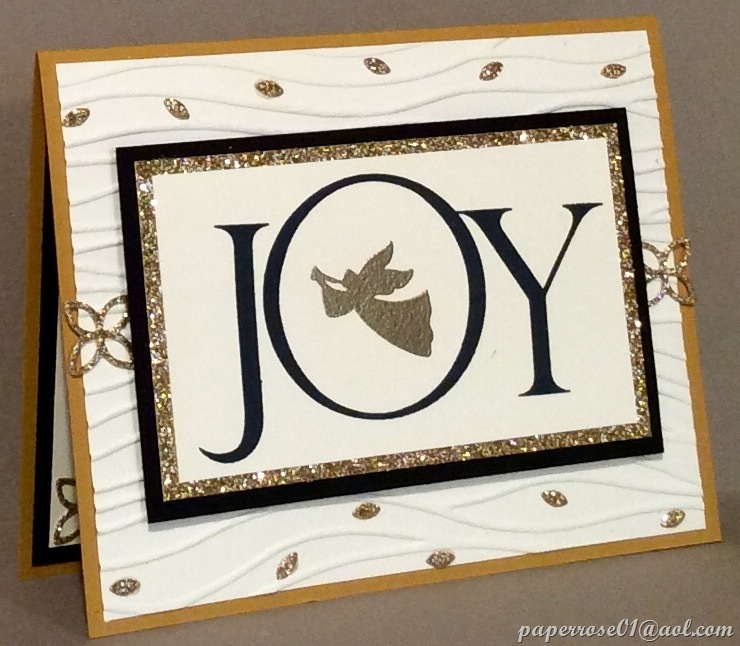 I used a retired slanted embossing folder to give texture but not detract from the picture. 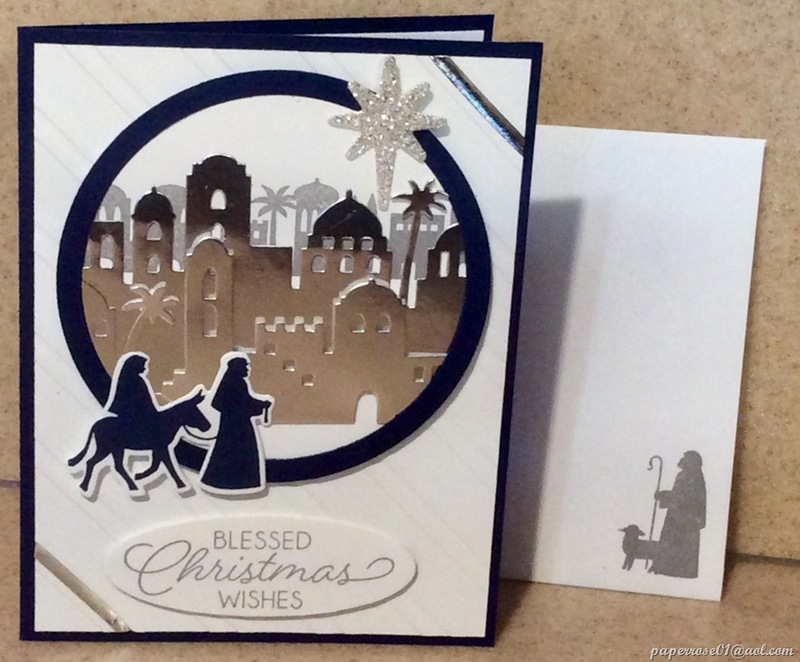 Mary and Joseph are stamped in navy, die cut and adhered to the Bethlehem image. A silver glimmer star is elevated jubilantly in the sky. 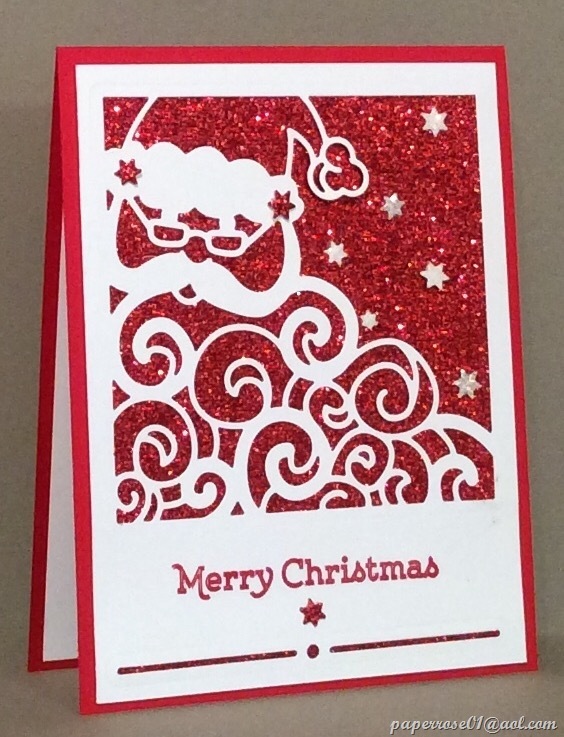 A bit of silver Washi tape embellishes 2 corners of the front layer. These are the 4 cards for November Stamp Camp. The cost is $12 for the first 4 and $2 for each card thereafter. 12 cards would be $28. For anyone who is a glutton for punishment and wants to do 16, the cost would be $34. So pick and choose but please please please let me know early what cards you want and want day(s) you plan to be here. Please let me know if you have any questions or concerns. 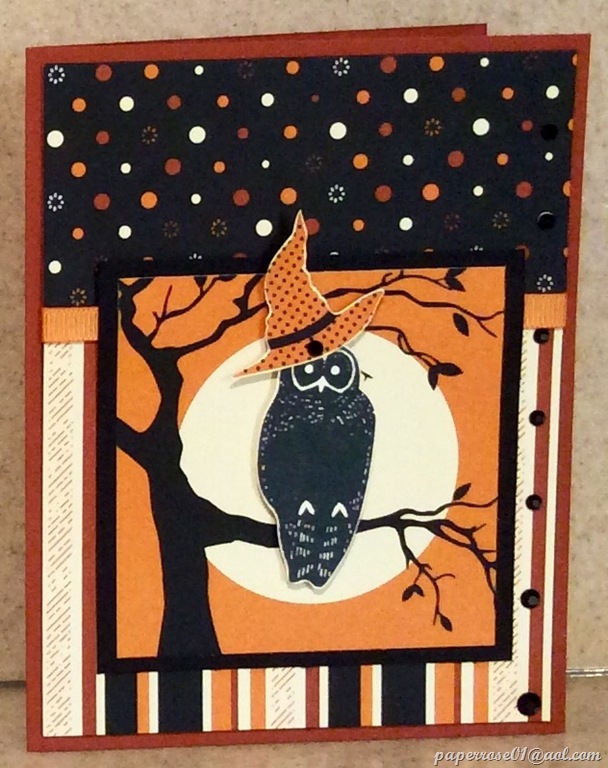 This Spooky Night card is all about the Designer Series Paper (DSP). The Spooky Night DSP features 32 – 3 X 3 scenes of a spooky black tree against the moon and Pumpkin Pie sky. The owl is from the Spooky Cat stamp set and was stamped in black on Very Vanilla cs, and fussy cut. After adhering the owl to the branch, a cute hat is fussy cut from another sheet of DSP and placed atop the owl’s head. This art scene is adhered to a black cs layer which is then adhered to the DSP decorated front layer. Black rhinestone jewels embellish the right side of the card and the owl’s hat. BUT – if you have the Nola the Cat Punch, you can punch black or orange cats right from the DSP! In this image, a black cat is punched from the DSP, adhered to the black branch, and finished the same as the card above. A bow of 1/4” grosgrain or cotton ribbon embellishes the upper corner. 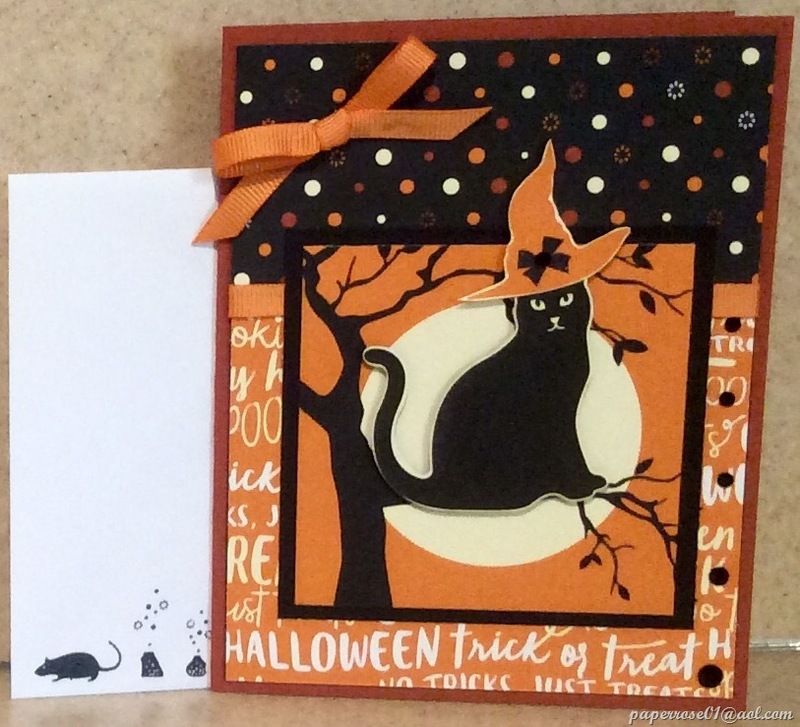 Feel like a fall card instead of a spooky cat or owl? Then rest awhile in a Cajun Craze lawn chair festooned with fall leaves in copper foil and other colors. 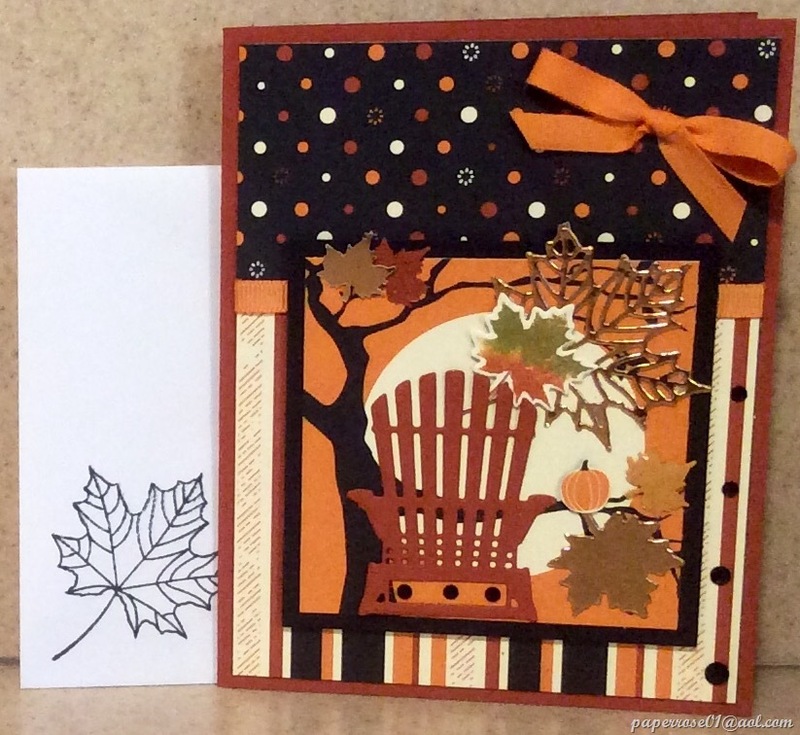 Create a special colored leaf using the baby wipe technique and Cajun Craze, Old Olive and Pumpkin Pie inks. The chair and leaves are from the Seasonal Layers Framelits Dies. The card is finished with a perky orange bow and the Black Rhinestone Jewels. Well, this is our final October Stamp Camp post. 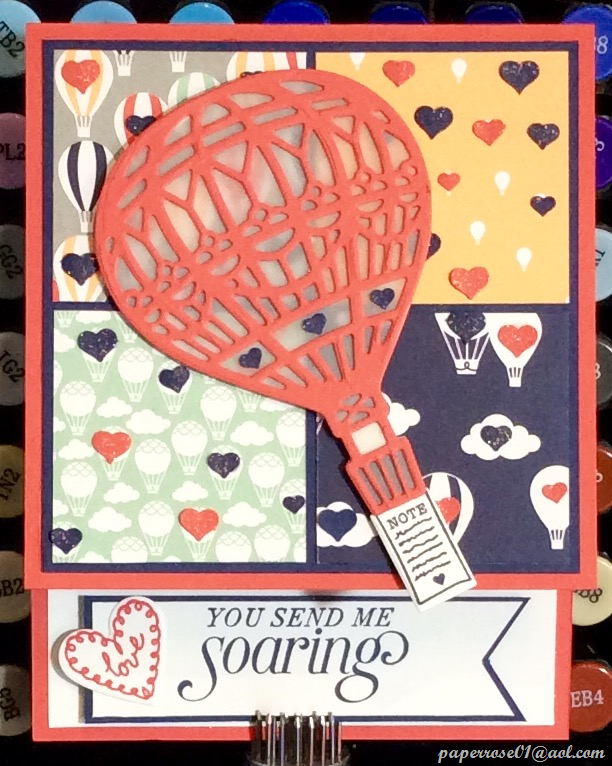 I hope you like several of these creations and will come to October Stamp to paper craft your heart away!!!! Remember – I need to know by Monday October 2nd which cards you wish to do. In the first post for October Stamp Camp, I reminded everyone that Christmas Stamp-A-Stack will be October 19 and 21 – 12 person limit each day. I also said that my plan for 4 each of 3 cards was subject to change. Well,change is upon us as I did come up with a 4th card that is beautifully elegant and simple. SO… you will have the option of 3 each of 4 cards (12 total) for $28 or 4 each of 4 cards (16 cards) for $34. 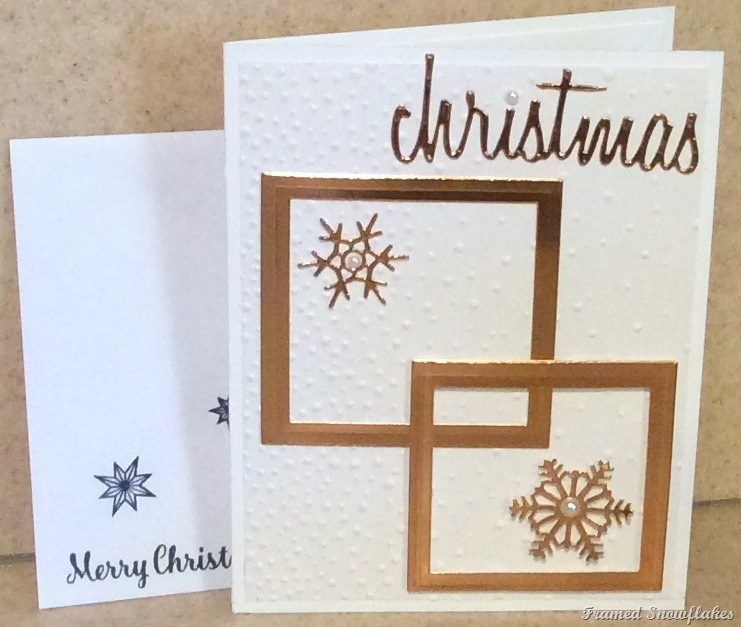 All cards will have layers and embellishments, and will be as simple as we can make them. The sooner I know whether you prefer the 12 or 16 package, the more I can prep for you. I will have samples for you to view at October Stamp Camp. I promise NO MORE CHANGES! Were you wondering if I would ever return? Would there be no more stamp camps? Was Rosemary alive and moving? Well, I am happy to announce I am back albeit a bit slower than prior to surgery. We will have a June Stamp Camp – but on June 8, 9, and 10. Hours on the 8th and 9th will be 12 noon to 4 pm and the normal 9 am to 4 pm on Saturday. My body winds down a bit early and at this point, I cannot accommodate evening hours. 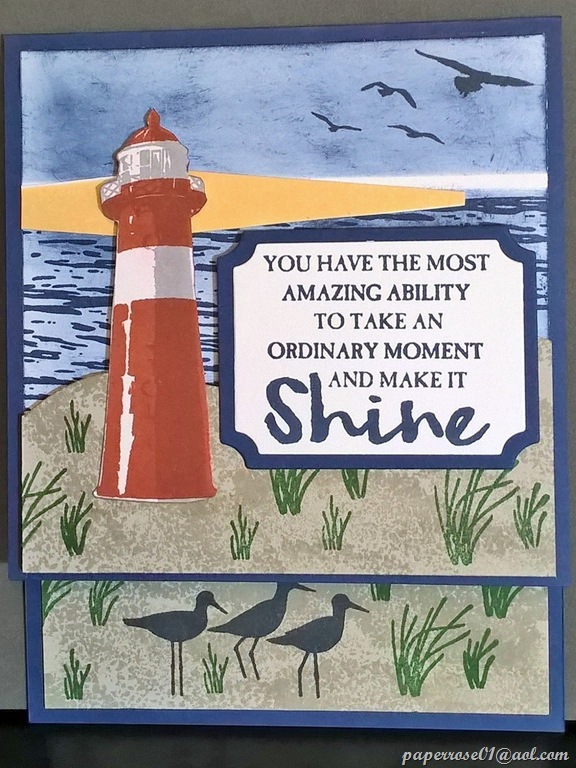 I am offering 2 masculine cards for June Stamp Camp – High Tide and Nailed It. 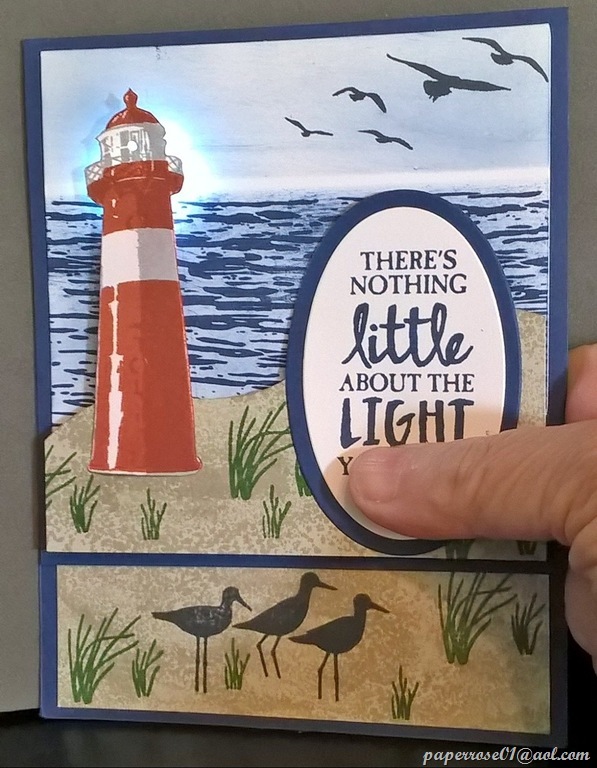 You will have the opportunity of lighting the lighthouse on your High Tide Card. The cost for a lit High Tide card will be $4.50 as it includes the light, battery and circuitry tape. If you choose to do the unlit card, the cost is the standard $3.00. I would encourage you to try 1 lit lighthouse. I can see the lights used during the holidays for stars, trees, etc. Although I will try to explain the process in my directions, I will be available for 1:1 assistance. If you choose to do 4 cards, the cost is the standard $12 except for the lit card. If you choose to do more than 4 cards, the cost is $2.00 except the lit card is $1.50 additional. 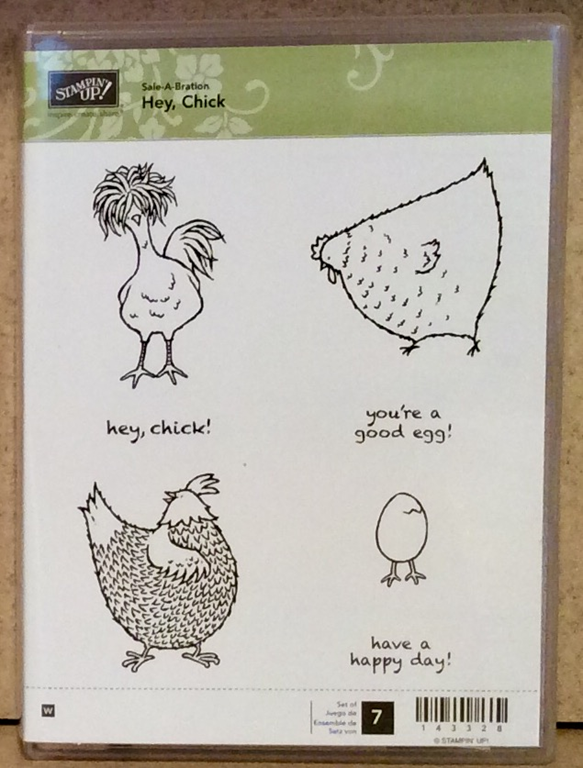 These are both masculine cards and work well for Father’s Day, birthdays, and thinking of you occasions. This is the lit version of High Tide. You can see the light being emitted from the lighthouse. The lighthouse lights up when the lower part of the message is pushed. I will make a small die cut message for the inside indicating where to press to see your lighthouse shine. then in Cajun Craze. After the lighthouse has been fussy cut, the bottom is adhered to the sandy beach and some tufts of grass are added. Birds are stamped in Memento Tuxedo Black . As noted below, the lighthouse is fussy cut and the bottom adhered to the sandy beach. At this point, the lighthouse/beach is placed on the water and the top and sides of the lighthouse and the beach line to the right are traced. Copper conductive tape is run from the top area of the light house, down the sides and over to the right hand area of the watery area. A Chibitronics white LED circuit sticker is placed over the top conductive take area. The 3 V battery is placed positive side down in the water area, over the positive conductive tape. The paper is creased and the negative side of the battery is placed on the opposite side of the paper and on the negative conductive tape. The battery is held in place with small pieces of 1/8” foam adhesive. The penciled lines are erased and the lighthouse and sandy beach are adhered with 1/8” foam adhesive. A message is added and when a certain section of the message is pressed, the lighthouse lights up. These instructions sound much worse than the process really is. This is an unlit version of High Tide. I added the yellow beacon of light but the card would like nice without it. 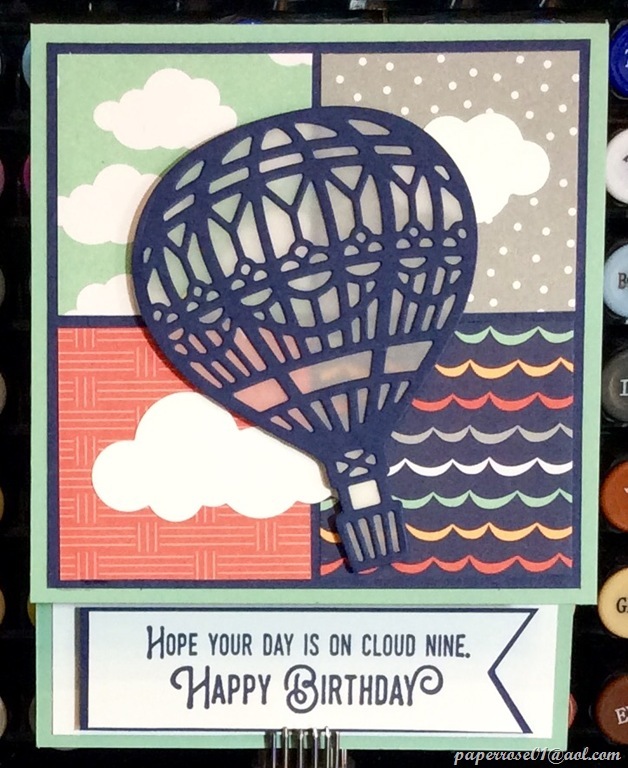 Like the card above, the sky has been sponged in Night of Navy. This sky looks a bit stormy while the sky in the lit card is calmer looking. There is a small horizon line and then the water is sponged in navy also. The water lines are stamped over the sponging. The beach area is a 2X2 piece of Sahara Sand that has been stamped in Sahara Sand and die cut with a hill die so the right side of the beach is the highest. The lighthouse is stamped first in Smoky Slate and then in Cajun Craze. After the lighthouse has been fussy cut, the bottom is adhered to the sandy beach and some tufts of grass are added. Birds are stamped in Memento Tuxedo Black .The sandy beach is adhered to the card front with dimensionals. I also used dimensionals to adhere the top part of the lighthouse and top part of the message. I added a beach area on the bottom of the inside layer and stamped ducks and more tufts of grass. Whew! What an explanation. Honestly, neither card is difficult once you have the pieces laid out in front of you. As I mentioned earlier, I will give 1:1 assistance on the lit cards. I do want to try the Circuit Scribe Conductive Ink Pen to see if it is easier than using the copper conductive tape. To repeat from above, June Stamp Camp will be June 8, 9, and 10. Hours on the 8th and 9th will be 12 noon to 4 pm and the normal 9 am to 4 on Saturday the 10th. Please please please let me know if you are coming and how many of which cards. If you want to only due the lit lighthouse, that will be just great. I will have your new catalogs ready to pick up. I will be posting Nailed It shortly.